During the 2016-2017 fiscal year, ITS Teaching & Learning upgraded the Sakai to version 11.2, marking the first time that ITS had upgraded a learning management system at UNC-Chapel Hill between Fall and Spring semesters. In other accomplishments over the past fiscal year, Teaching & Learning rolled out to faculty members the video platform Warpwire, boosted adoption of Poll Everywhere and introduced a new capability for Mobile Print for CCI Printing. In addition, the division is preparing to launch a pilot–likely in Spring 2018–for a location-aware attendance app. Please read more about Teaching & Learning’s various efforts in this post below. The upgrade from Sakai 10.3 to 11.2 on December 20, 2016, brought long-anticipated changes to faculty, students and staff who rely on the learning management system, including a mobile-friendly interface, a new grade book tool and an integrated online video platform (Warpwire). 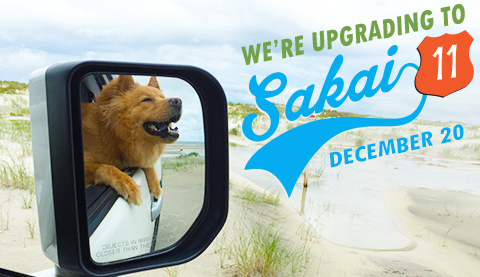 The Sakai team’s confidence in the feasibility of a December upgrade was grounded in the previous December’s success, when the database underpinning Sakai was upgraded for the first time since 2011. From an infrastructure standpoint, the December 2015 change was perhaps more significant; however, upgrading the Sakai interface in the middle of the academic year was not without risk. The Sakai team recognized that while the new responsive design greatly improved accessibility and usability, users might find these changes disorienting, particularly so close to the beginning of the new semester. The Sakai Support team worked during the Fall semester to develop online help resources and offered preview sessions to interested faculty and early access to support staff in schools and departments. In January before classes began, the team was ready to provide as many face-to-face consultation sessions as possible, but was surprised that the number of requests was only slightly greater than that of the previous January and that only a few users requested an orientation to the new interface. Help tickets, however, were up through mid-semester as users encountered previously unidentified bugs. In response, the Sakai development team made dozens of updates to the open-source codebase, issuing these changes as quickly as possible during the Thursday 5 – 7 a.m. maintenance period. The anecdotal feedback ITS received on Sakai 11 was chiefly positive, including appreciative comments from students on social media. During Fall 2016 and Spring 2017, Sakai@UNC was used by faculty and staff to support more course sections and projects than ever before: 8,006 sections and 3,150 projects, up 6 percent from the previous year. In Spring 2017, ITS Teaching & Learning rolled out to faculty members the video platform Warpwire, which is integrated with Sakai@UNC. With Warpwire, faculty members and their students can easily record and upload audio, image and video files from their mobile device or laptop. Using this solution for secure streaming, faculty and students can more readily access and share multimedia materials that they create. Warpwire assets can be embedded directly into other Sakai content such as learning modules and assessments. Warpwire is a key tool for students developing multimedia assignments and for faculty who have moved some or all of their lecture content to video for review outside of class. Faculty members can review detailed analytics to determine which students have watched which videos, including which percentage and segments of videos have been viewed. Since ITS Teaching & Learning rolled out and began supporting the Poll Everywhere application in 2011, more than 360 UNC-Chapel Hill faculty members have adopted the tool as a way to engage students in class. Poll Everywhere has been enormously successful with faculty members. By 2010, an increasing number of faculty members teaching in large lecture classes wanted to engage in what was beginning to be known as active learning. Prior to adoption of Poll Everywhere, some were using desktop classroom response systems to pose questions to the class. Students would use handheld devices—commonly known as clickers—to respond. But these instructors were using different systems, and students were having to pay as much as $40 for devices for individual classes. When one faculty member was eager to adopt Poll Everywhere, Teaching & Learning embraced making the tool available and supporting faculty’s use of it. Poll Everywhere was and is a compelling solution because the system enables students to use devices that they already own, including smartphones, as response devices. In November 2016, ITS Teaching & Learning rolled out a new capability for Mobile Print for CCI Printing. Students can submit print jobs without the desktop client. 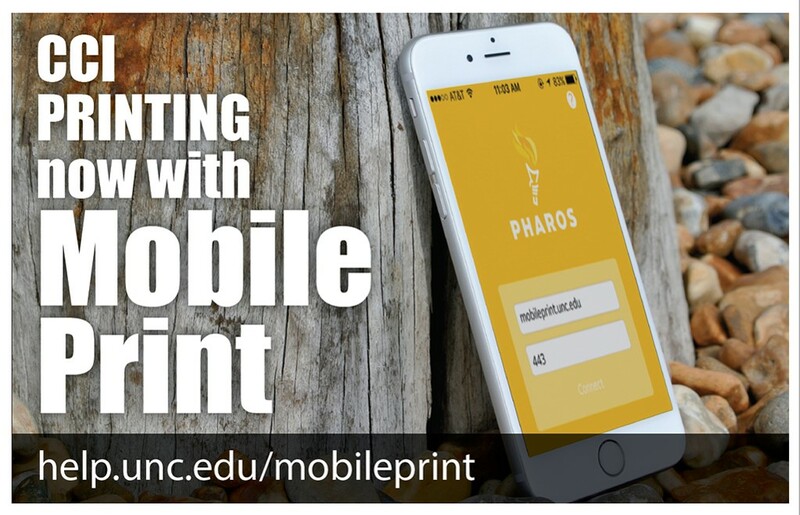 Android and laptop users can go directly to the print center website to print, and iOS users can install an app to print from their phone. A four-student team in Dave Stotts’ Spring 2017 Software Engineering course worked with ITS Teaching & Learning to develop a proof-of-concept application for taking class attendance. The team has given the application to Teaching & Learning for further development in anticipation of a Spring 2018 pilot. Students will check into class when their phones are near Bluetooth beacons that will be installed in selected large-capacity classrooms.